Welcome to the website for Business Computer Applications 11 and Business Information Managment 12. These courses cover how to use various computer technologies to preform business applications. You will generally follow the GCF Word tutorials. 1st Paragraph: No indent on first line, 0.5 inch hanging indent. 1.15 line spacing. 2nd Paragraph: 1 inch left indent, double spaced. 3rd Paragraph: 1 inch indent on first line, no indent on other lines. 1.5 line spacing. 4th Paragraph: 4 lines of numbers (with different # of digits) aligned using tab stop so that the decimal point is indented 2 inches. 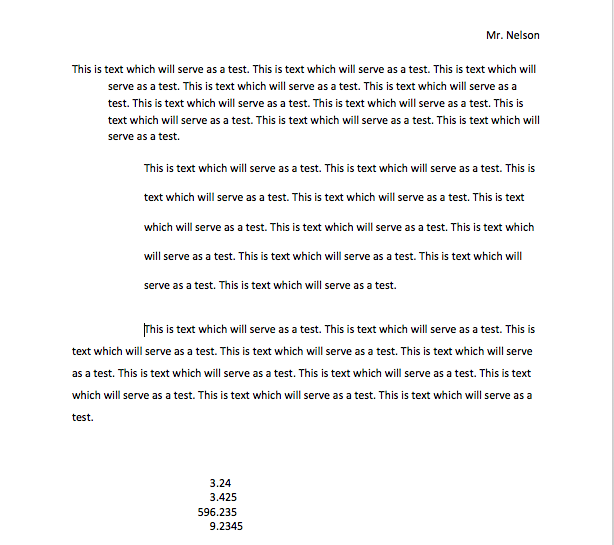 Assignment: You will create 3 versions of a business letter to the Prime Minister. You will write a one page letter to the Prime Minister using the correct address and salutation for him (look it up). You will use the school's address as your return address (look it up.) Your letter could be a real concern of yours or it could be silly. It must contain a list of some sort. You will create a block format, modified block format, and semi-block (indented) format version of the letter. You should use this guideline for block format, and this guideline for the other formats. Print your letters and submit to Mr. Nelson directly. Assignment: Create a document which is landscape oriented for legal sized paper with 1.5 inch margins at top and bottom and 0.5 inch margins for left and right. Save as word6_YOURNAME.docx and submit. 2nd Section: 2 columns with line between containing a bulleted list. First column should have 7 items, Second should have 10. Use column breaks. 5th Section: 3 columns, no line between them, each column is 1.5 inches wide with 1 inch space between. Columns contain a continuous lettered list with 6 items in the first column, 4 items in the second column and 9 in the last column. Use column breaks. Assignment: Create a document as outlined below. Save as word8_YOURNAME.docx and submit. 2-11th Page: Header with your name, a line with "Date Produced:" and a date field which is not updated, a line with "Date Printed:" and a date field which IS updated. A footer with the page number. Pages should be numbered 1-10. Assignment: Create a document as outlined below. Save as word9_YOURNAME.docx and then use the reduce file size option to compress your pictures as much as possible and save as word9reduced_YOURNAME.docx. Submit both files. Three arrows of different colours pointing down, these should be a group. The arrows should be equally distributed across the rectangle horizontally and go from top to bottom of the rectange vertically. Assignment 1: Download the starting file . Then turn on track changes and edit the document so that it is an effective business letter. You may assume the letter is being sent by someone at FNSS (and thus use the school's address). Changes should be shown "inline" not as ballons. Save as word12a_YOURNAME.docx and submit. Assignment 2: Download the starting file . Add a comment to each paragraph of section explaining the key issues and suggestions for improvement. Save as word12b_YOURNAME.docx and submit. Assignment: Use SmartArt Graphics to create an org chart for the the company "Nelson Inc." You may make up the names for all employees. The CEO answers to a board of directors, she has an assistant who answers directly to her. There are two vice-presidents (one of sales, one of design) who answer to the CEO. The VP of sales has 3 managers who answer to her, the VP of design has 2 team leaders who answer to her. Eeach sales manager has 2 salespeople who answer to them. Each team leader has a team of 8 designers. There is a legal department consisting of a senior legal counsellor who answers to the CEO, a legal secretary and a junior legal counsellor who both answer to the senior legal counsellor. There is a CFO who reports directly to the Board. Save as word13_YOURNAME.docx and submit. Assignment:Create a document which uses at least 5 different styles (title, heading etc.) You could make the document on places you have visted, classes you are taking or any other topic. Save 3 different versions of the document each with a different layout. See example: 1, 2,3 Save as word14a_YOURNAME.docx, word14b_YOURNAME.docx and word14c_YOURNAME.docx and submit. Assignment 1:Create a document which recreates of this income sheet. It does not have to be an exact copy but must be neat and contain all information in the original. Save as word16a_YOURNAME.docx and submit. 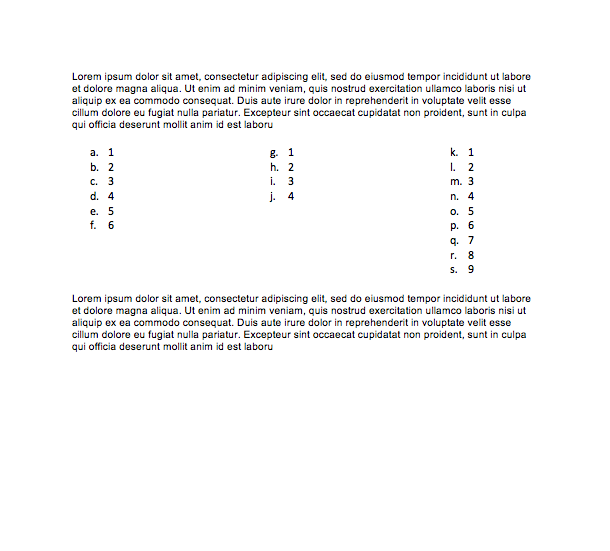 Assignment 2:Create a document which recreates of this copy req form. It does not have to be an exact copy but must be neat and contain all information in the original. Save as word16b_YOURNAME.docx and submit. Assignment: See assignment file Use the addresses from Brian Dunning for your mail merge. 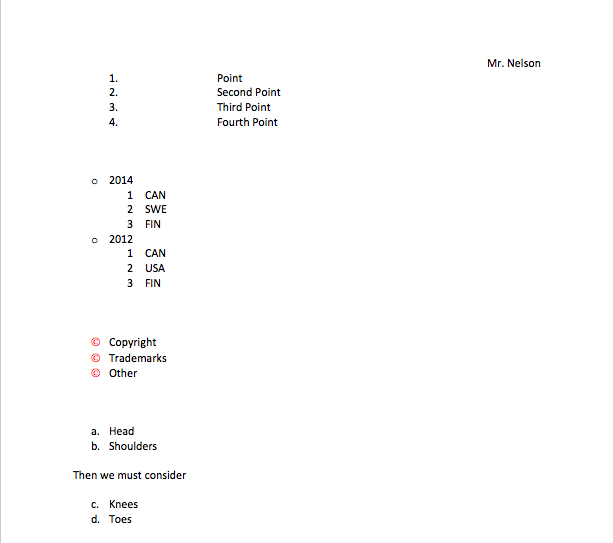 Assignment: Create a sheet which includes the following. See example. Upload to FreshGrade. 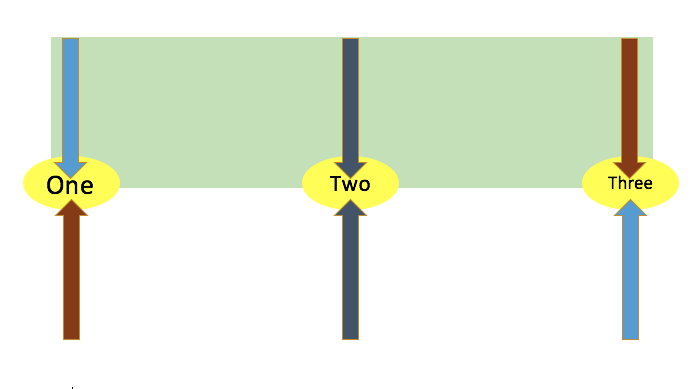 Column C: the first 101 cells all countain the letter "c" which is centred. Assignment: Create a workbook which includes the following. See example. Upload to FreshGrade. Each worksheet tab is coloured, months in the same quarter have the same colour. Each worksheet has the title "[MONTH] Budget"
Print a copy and hand in directly. Assignment: Download the following worksheet and modify it so that it will perform the listed mathematical operations on the numbers provided in columns B and C and give the answer in column D. Upload to FreshGrade. Assignment: Download the following worksheet and add formulas it so that it will use the physics formulae given on the numbers provided. Upload to FreshGrade. Assignment 1: Download the following worksheet. For the first part add a formula to calculate the line total in D2. Then use the fill tool to fill this formula to D6. 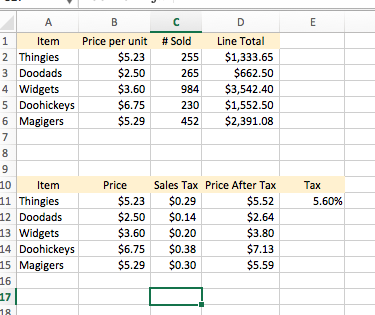 Use an absolute reference to determine sales tax in C11 based on the rate in E11 and use the fill tool to complete column C. Complete column D using formulas and the fill tool. See example. Upload to FreshGrade. 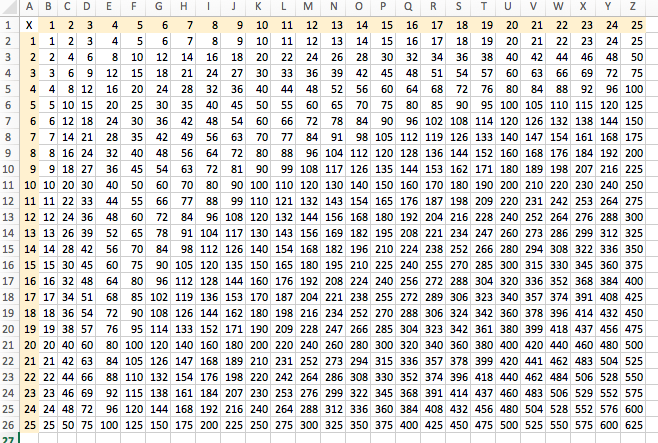 Assignment: In column "A" fill the first 10 rows with different numbers. 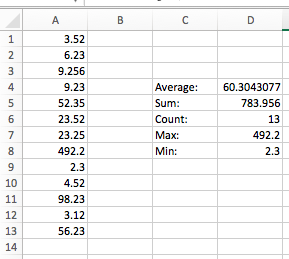 Use functions to calculate the sum, average, max, min and count of those numbers. See example Upload to FreshGrade. Assignment: Download this worksheet. 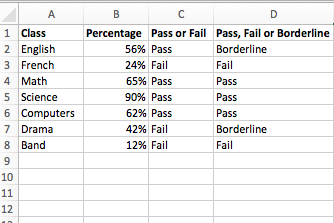 Use "if" statements to calculate if the student passes each class (above 50% is a pass). Then use a nested if statement to determine if the student is failing (less than 40%) is borderline (40-60%) or passing (60% or higher). See example Upload to FreshGrade. Assignment: Download this worksheet. 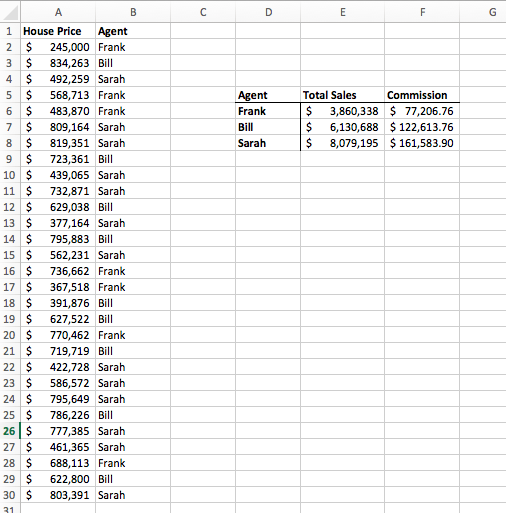 Use "SUMIF" statements to calculate the total sales for each of the 3 real estate agents in the sheet. Use this total to calulate their commission at 2% of total sales. See example Upload to FreshGrade. Assignment: Download this worksheet. Use the string fuctions to separate the names into first and last names. 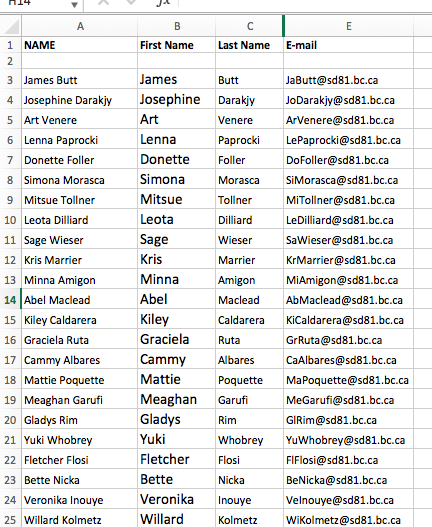 Then use first and last names to generate e-mail addresses which have the form "first two letters of first name" + "last name" + "@sd81.bc.ca." See example Upload to FreshGrade. Assignment: Download this worksheet. 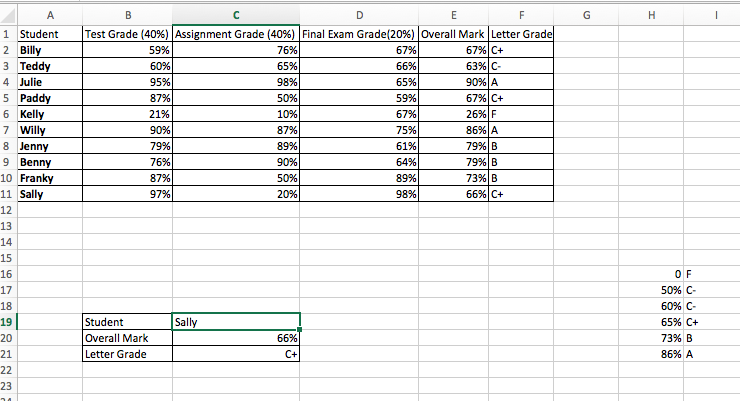 Calculate overall grade for each student. 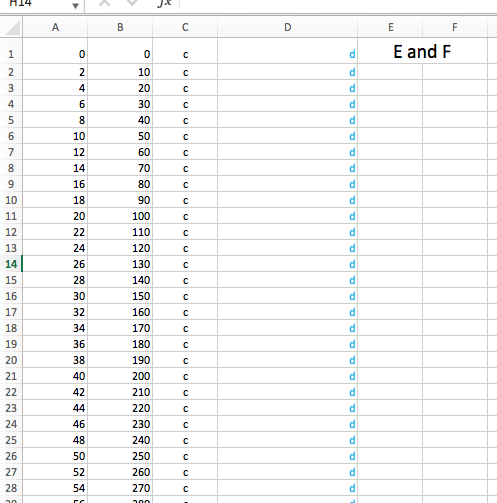 Use VLOOKUP and a reference table to calculate letter grades for each student. Set up a search so that when a student's name is entered their overall grade and letter grade show. See example Upload to FreshGrade. Examine the data from the National Longitudinal Youth Survey from Dr. Rasp's Website. First clean up the data by removing any entry with a negative value. You can do this by sorting the data from smallest to largest then deleting the negatives. You will have to do this for several columns. Calculate what percentage of the youth describe their body weight the same way as they would be classed by BMI. 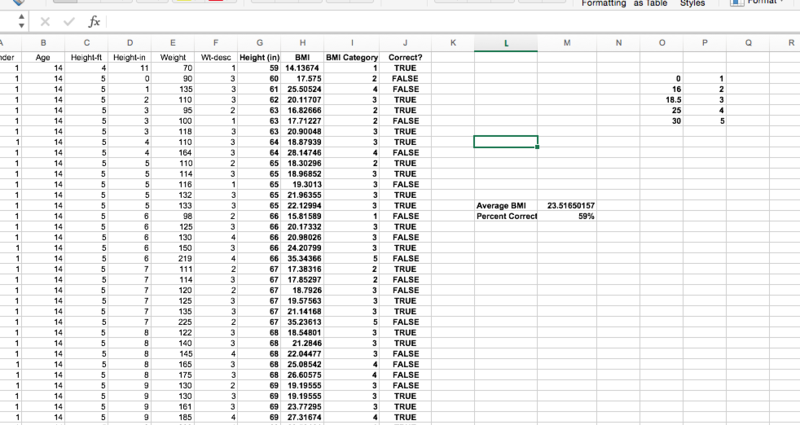 To do this you will have to use a lookup table as you did in the letter grade assignment to determine BMI categories. It is important to use fixed cell references by adding "$" to the lookup table references. You can then see if youth "correctly" self identified by using the EXACT function. Finally you can use the COUNTIF function to count how many of those values are "TRUE". This divided by the total number of entries will be the percentage "Correct." Final product should look something like this. See example. Upload to FreshGrade. Assignment: Examine the data from the Kentucky Derby from Dr. Rasp's Website. 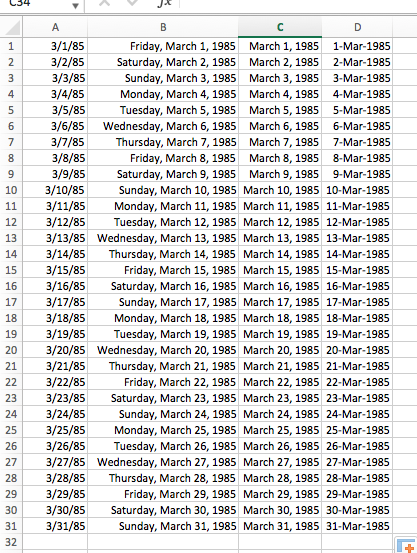 Find data for the years from 2010 to the present using google and add that information to the dataset. 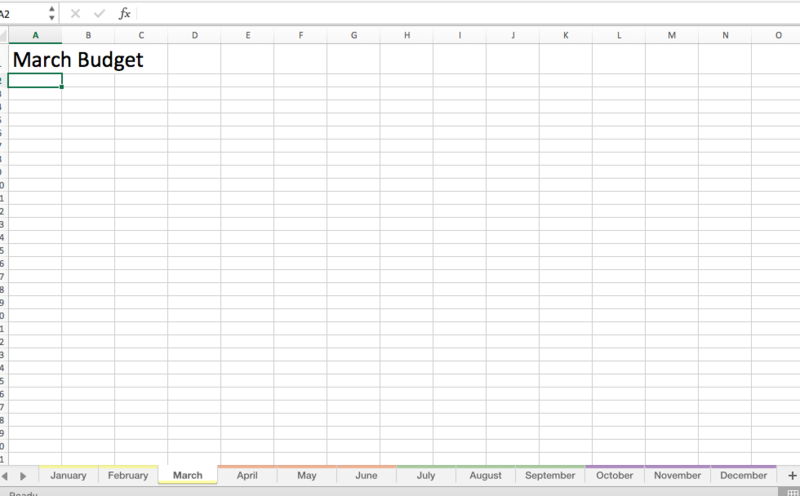 Finally create a line graph showing this data. 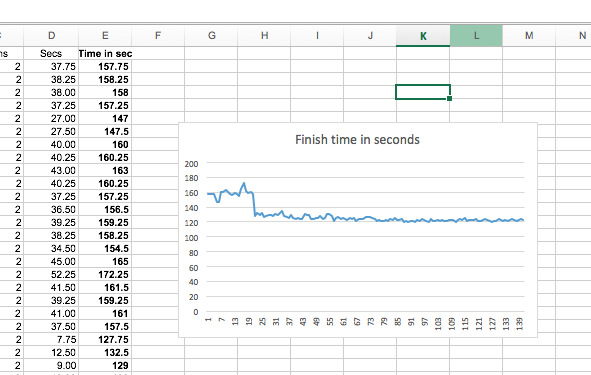 To do this you will have to calculate race time in seconds. Your finished product should look something like example. Upload to FreshGrade. Assignment: Download the polling data from the 2004 US presidental election from electoral-vote.com. 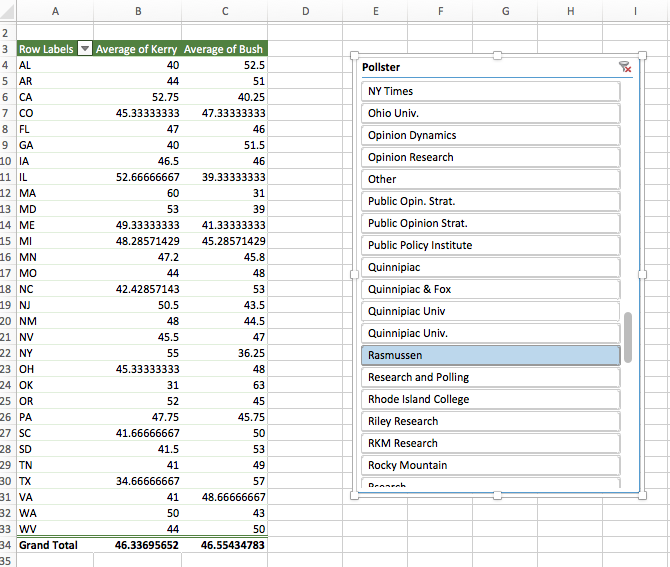 Use this data to produce a pivot table with rows of states and values for the AVERAGE of the polls for each candidate in each state. Add a slicer to select or de-select various polling companies. See example. Upload to FreshGrade. Assignment: Download "Billy's Report Card". Write a function which will determine his overall percentage based on his marks on various projects worth different amounts. Use goal seek to determine what he must earn on his final project to get 85.5% (an A). Upload to FreshGrade. Assignment: Download the full dataset of major projects in Alberta from majorprojects.alberta.ca/ . Create an analysis of the data which includes at least 2 charts, a pivot table and a slicer. Exactly how you analyze the data is up to you. Upload to FreshGrade. Assignment: Create an 8 slide presentation following these guidelines. See example. Upload to FreshGrade. Assignment: Create an 8 slide narrated presentation following these guidelines. Upload to FreshGrade. Assignment: Read the following scenario. Decide how Jim should push the board and create a narrated power point presentation from his perspective. The presentation should include animations and images and be between 4 and 6 slides in length. Each slide should have no more than 10 words on it. The last slide should be a sources slide listing any sites used. Upload to FreshGrade. 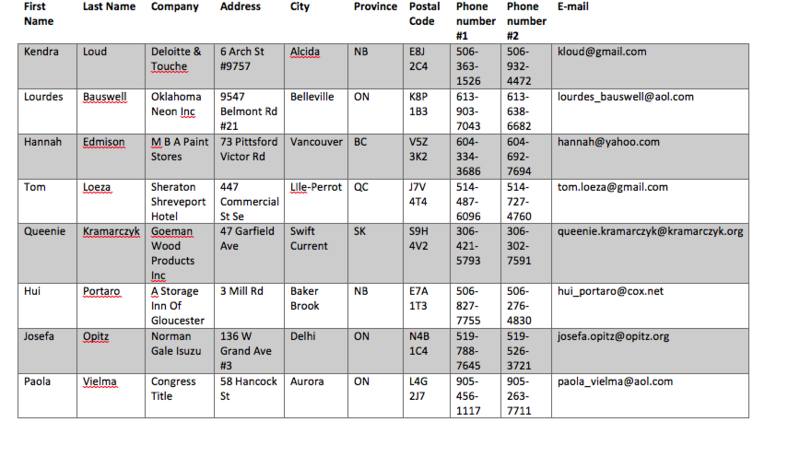 Assignment: Open the sample database and then open the customers table. Make the following changes to the table. Save entire database as access2_YOURNAME.accdb and submit to Google Classroom. Create a new entry for Frank Smith with phone number 555-552-5552, who lives at 5634 Pine Vista, Big Sur, California, 93920. His e-mail address is fsmith@email.com. Find the record for Jack Ford and change his e-mail address to jf@email.com. Remove all gridlines from the table. Change the colour of the alternate rows to a colour of your choice. Assignment: Open the sample database and then make the following changes. Save entire database as access3_YOURNAME.accdb and submit to Google Classroom. Using the form called "Orders" create a new order for two dozen Cranberry Walnut Cookies for Ed Bradshaw to be picked up June 28th. Mark that he has paid and make a note that he will pick the order up at 8am. Using the form called "Customers" find the record for Harper Wilder and change her phone number to 919-555-6555. Assignment: Use filtering to determine the number of entries meeting various critera. Report by completing the Google Form in the Google Classroom. Assignment: Open the sample database and then make a new querry. Save entire database as access5_YOURNAME.accdb and submit to Google Classroom. Select the customers table to include in your querry. Set city and zip code fields to not show. Filter the customers to only include those who live in Durham or have zip code 27514. Save the querry as "Durham Customers". Assignment: Open the sample database and then make a new querry. Save entire database as access6_YOURNAME.accdb and submit to Google Classroom. Create a querry which will return the names and phone numbers of the 3 customers from Durham who have orders which are NOT pre-paid. Assignment: Open the sample database and then make a new querry. Save entire database as access7_YOURNAME.accdb and submit to Google Classroom. Assignment: Make new query with first name, last name and e-mail address of all customers on any form of the mailing list. Create a report of this query and export as a pdf, it should all be on a single page. Assignment: Open cookies sold report, add a date and time to the header, add page numbers to the footer, choose a new theme, and add a logo of your choice. Save as pdf and submit. Create new fields for the customer table: a yes/no check box for have credit card on file, and then, a short text field for “Type of Card” which must be “VISA” “MC” or “AMX” or a blank (use verification) and a short text for “Card Number” which restricts the length to 16 characters or less. Create a form from the customers table, Delete the subform, Create a combo box for city and give the following choices: Raleigh, Durham, Hillsborough,Cary, Chapel Hill, Garner,or Charlotte. 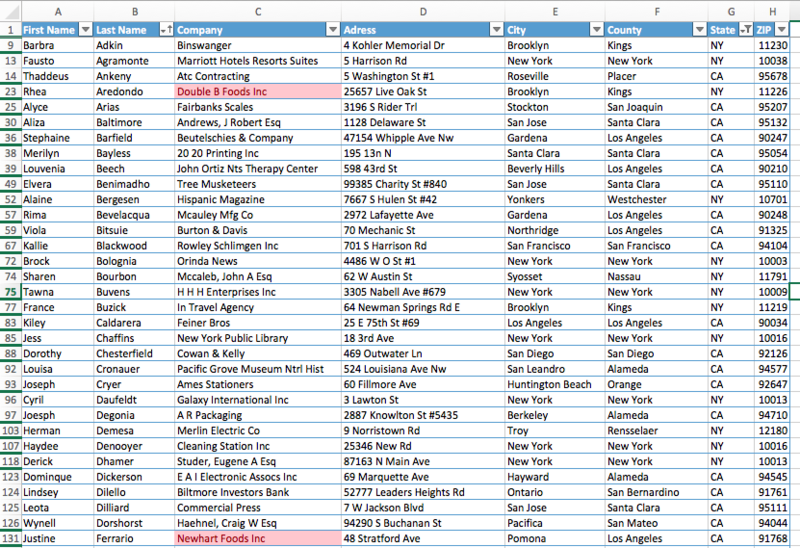 Store the value in the City field and label the combo box NC City List. Save your form as “Customer Form”. Build a database from scratch for a small primary school. There are 2 kindergarden classes with 17 students in each. There are two grade 1 classes with 20 students in each, and there is one grade 2 class with 23 students in it. Each class has a different teacher. In addition each student has a parent or gaurdian, though some parents have multiple children. Each student has a grade in their class (this is probably not accurate for a primary school) either A, B,C,D, or F. You will need to make up or use online data for the names and addresses of the parents, teachers and students. Create a querry which returns the names and phone numbers of parents of students in a particular teacher's class. Create a querry which returns the names and addresses of all parents of students in kindergarten. Create a report of the names of all students in grade 1 who have an A. Create a report of the names of students in either grade 1 or 2 who have an F and their parents names and phone numbers. Use the tutorials as learn.wordpress.com for assistance. A one paragraph summery of what you think were the three most important things to come out of that meeting. Take minutes of the meeting, try to keep up with the video but pause it if needed. Bibliography: Create a paper using Word (or modifiy an existing one) so that it has at least 10 citations, an end note and and footnote, it should have a table of contents which is automatically generated and a bibliography which is also automatically generated. Final Project: Complete this project once all other aspects of the course are completed.